Trying to get Wiimmfi to work, having problems.. I've been trying to get Wiimmfi to work on my PC recently. and tried to get Wiimmfi to work. I followed all the steps perfectly, I set up the .iso files to be "fixed" for wiimmfi, and I set up everything. Now, obviously, as I tried to get onto wiimmfi, the "23918" error code pops up, which means I'm banned by default because I'm using Dolphin. So I got the Wiimmfi unbanner via the official links (https://www.dropbox.com/s/pagcu7bfmtjce5z/Wiimmfi%20Unbanner.exe), set it up, and ran it. This is where I had the problem. 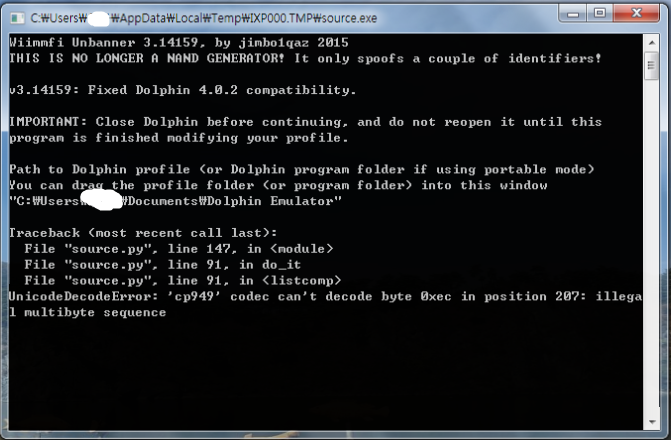 Whenever I go into my "My Documents" folder and drag the "Dolphin Emulator" folder into the CMD popup, it spits out a message for s aplit second and turns off. This is the message that it turns up. Note, I took the screenshot almost immediately as I pressed "Enter" after dragging the folder, since it would turn off immediately. I tried asking on the Reddit Dolphin sub, but it's very inactive and I only got one reply asking me is I turned off Dolphin before I turned on the Unbanner, which I did. -Deleted and re-installed Dolphin on multiple versions, including the newest versions and version 4.0.1 because I heard somewhere that that would fix it. -Checked in another folder (As my Dolphin was installed to my :E disc and the folder in the documents was in :C). the Dolphin Emulator folder was not there. I stumbled upon the "UnBanMii" thing that /u/RachelB made on this site (https://forums.dolphin-emu.org/Thread-is-dolphin-banned-for-wiimmfi-servers?pid=331030#pid331030), I have no idea how it works and there is no ".exe" file that they're talking about. Just a bunch of files like "UnBanMii.sdf", "UnBanMii.sln", and "UnBanMii.v12.suo" that there is no explanation of ANYWHERE on how to run. I heard that this program was better than the Unbanner, but I have no idea how you're supposed to run it. I've been trying to get this to work for over 4 days, and still no progress from when I first tried the Unbanners. If you have any non-ASCII characters in your username (I suppose it would be Korean characters in your case), maybe the program isn't able to handle that. I'm not certain if that's the problem, but it's the most likely explanation that I have. Try temporarily moving the Dolphin Emulator folder to a different location that only has ASCII characters in its path, and then move it back once you've run the program. (07-02-2018, 01:43 AM)JosJuice Wrote: If you have any non-ASCII characters in your username (I suppose it would be Korean characters in your case), maybe the program isn't able to handle that. I'm not certain if that's the problem, but it's the most likely explanation that I have. Try temporarily moving the Dolphin Emulator folder to a different location that only has ASCII characters in its path, and then move it back once you've run the program. I actually did read about that on a completely different thread with the same error code, (it was Chinese characters in their case) so I changed the file location to another (english name) folder and made sure that there would be no foreign characters in the file path (except for the "Won" sign, which is impossible to change since it's substituted for '\' on Korean computers by default). It didn't work and turned up the same error. Do you, by any chance, know how to get the "UnBanMii" thing working? I think that might have less problems. (07-02-2018, 04:34 PM)BeardWix Wrote: Do you, by any chance, know how to get the "UnBanMii" thing working? I think that might have less problems. Since the exe file seems to be gone, you'll have to use Visual Studio in order compile the files that are found at https://github.com/RachelBryk/UnbanMii. It seems like Visual Studio 2012 was used, but maybe newer versions also work? (07-02-2018, 05:46 PM)JosJuice Wrote: Since the exe file seems to be gone, you'll have to use Visual Studio in order compile the files that are found at https://github.com/RachelBryk/UnbanMii. It seems like Visual Studio 2012 was used, but maybe newer versions also work? Sorry, but Can you explain further? Like step-by-step? Please? Install Visual Studio, then open the .sln file in Visual Studio, change the dropdown in the toolbar from Debug to Release (unless it's already set to Release), then press the green play button (should be called Local Windows Debugger). This will create an exe file (and will also run it, which you can ignore). I don't know if there are any additional steps beyond that, because I've never tried building this specific software. This is more complicated that what you should have to go through, but I don't know if anyone has a copy of the exe somewhere... I guess it still is in Rachel's Dropbox, just being inaccessible to everyone due to Dropbox changing how public links work. (07-02-2018, 06:13 PM)JosJuice Wrote: Install Visual Studio, then open the .sln file in Visual Studio, change the dropdown in the toolbar from Debug to Release (unless it's already set to Release), then press the green play button (should be called Local Windows Debugger). This will create an exe file (and will also run it, which you can ignore). I don't know if there are any additional steps beyond that, because I've never tried building this specific software. I installed Visual Studio 2017, and in the first screen that pops up there's a bunch of options for "workloads" to install. 18 options in total. I do have the option to proceed without installing any workloads, but it says that in order to "debug" anything, I would need to install workloads. Which ones do I need to install in order to do what you told me to? EDIT: phew, I installed the "bare minimum" version but in order to open the "UnBanMii" file (which now has the Visual Studio icon on it) I need to download another 6.5 GB of files. Well, at least I have plenty of space and it seems to be working..
"Desktop Development using C++" is the one that's relevant for this. I'm not sure if it'll work without any workloads, but if it doesn't, that's the one you need to install. (07-02-2018, 11:23 PM)JosJuice Wrote: "Desktop Development using C++" is the one that's relevant for this. I'm not sure if it'll work without any workloads, but if it doesn't, that's the one you need to install. ok, as I said above (after you posted your reply; I didn't see because I kept the page open) it seems to be working. But if it doesn't, I'll try your method. I re-built the program and everything, I tried to "Release" it..
and in the output box where the messages pop up, there are about 30 lines that say "Unbanmii.exe (win32): Opened "so-and-so" file. Cannot find or open PDB file." And then it says "' UnbanMii.exe' has shut down [Ended? terminated? I don't know what word to use for "종료" in Korean..] (Code: 0 (0x0))." Using nwc24msg.cfg in global user directory. The message in the popup seems good, but on the output box in VS, it seems as if it failed.. What's happening? EDIT: the program has also created an UnBanMii.exe file in a folder called "Release", but launching it does the same exact thing. "Using nwc24msg.cfg in global user directory. then it immediately turns off. The wiimmfi doesn't work, either. It still gives me the 23918 error code.